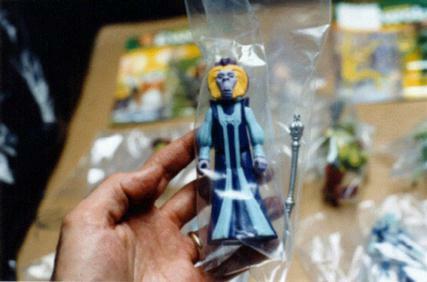 Fully painted and complete with plastic weapon, this was a proposed toy for the second series of Droids figures. This figure has also turned up in production-quality form, but this one in particular is a handpainted hardcopy. The sculpting and color scheme of this cartoon character are quite striking when compared to the original artwork for the accompanying card.